If you’re not aware, this weekend is the much lauded third annual D23 expo, Disney’s biannual insular version of a comic con. This year’s event will have tons of promotional material for films like Muppets Most Wanted, Saving Mr. Banks and Thor: The Dark World, but we aren’t particularly interested in those films. A big shipment of crates arrived for the convention with a twist on a familiar phrase marked on their side. Thanks to Coming Soon, we’ve got a closer look at the shipments, and our interest is highly piqued. 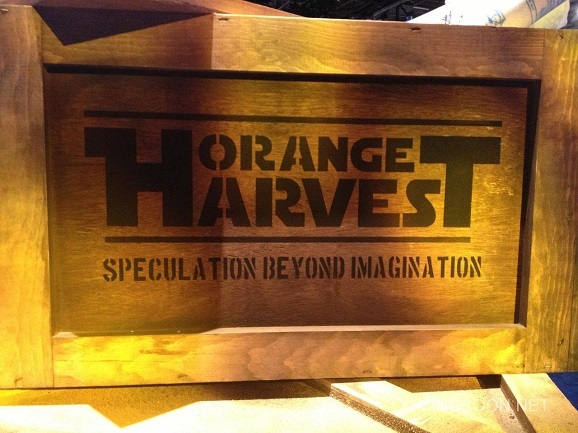 Some of the boxes are marked “Orange Harvest,” and bear the same font as that of the Star Wars franchise. We know two things at this point. Star Wars and all of its future projects skipped the San Diego Comic Con this year in preparation for Disney’s big event, and “Orange Harvest” is a play on Blue Harvest, the secretive working title for Return of the Jedi back in 1982. The tagline “Speculation Beyond Imagination” is a riff on the Blue Harvest tag “Horror Beyond Imagination.” They go all out. 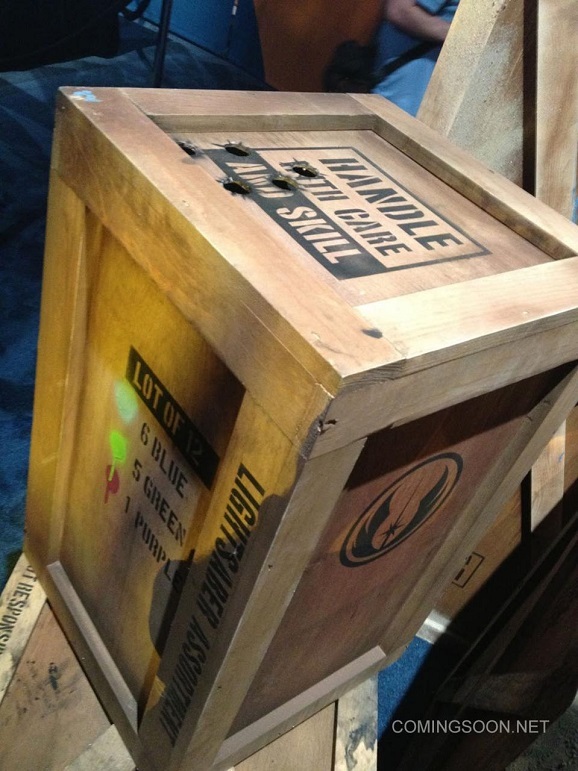 We all know that J.J. Abrams likes to keep his projects on the secretive side, but these crates are very on the nose and are obviously meant to be fun as well as promotional. Although maybe Brad Bird’s Tomorrowland also has a need for a big box of Bantha milk. But I doubt it. Let’s go through some of the more interesting boxes included here. 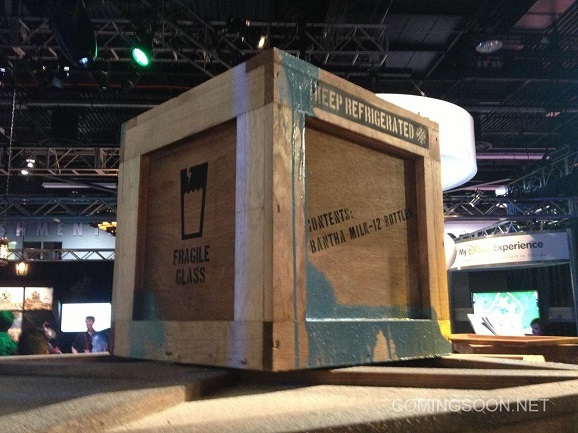 First up, the milk crate, which looks pretty disgusting, since apparently one of the bottles burst. And then no one kept it refrigerated. The smell! Next up, we have a box that obviously should have been brought in by a lowly roadie rather than a shipping crew. 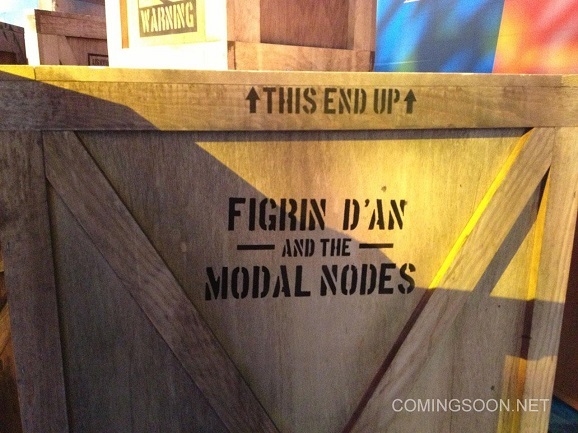 It obviously contains some of the instruments used by Figrin D’an and the Modal Nodes, otherwise known as the Cantina Band. I mean, assuming the actual band isn’t stuffed into the box. Disney has been known to treat its employees pretty harshly on occasion. And then there’s the box of lightsabers. I hope nobody cares if the box gets damaged, because there are five lightsaber-sized holes in the top of the box. Not a lot of care and skill being used while handling this one. There’s a purple one in there, so maybe Samuel L. Jackson is lurking around somewhere. And then we have this last one, from which something appears to have escaped. 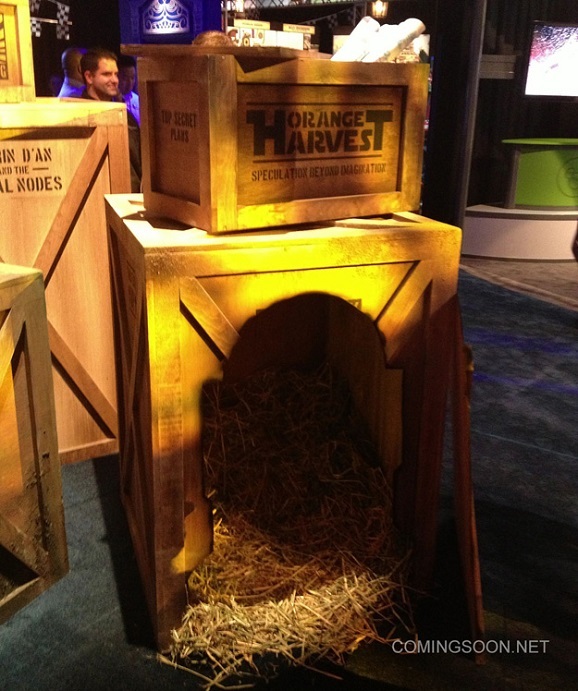 There’s a lot of hay-looking material in there, and the hole in the side of the crate is shaped like a certain bleeping droid we all know and love. Not sure why they went with this packing material however. 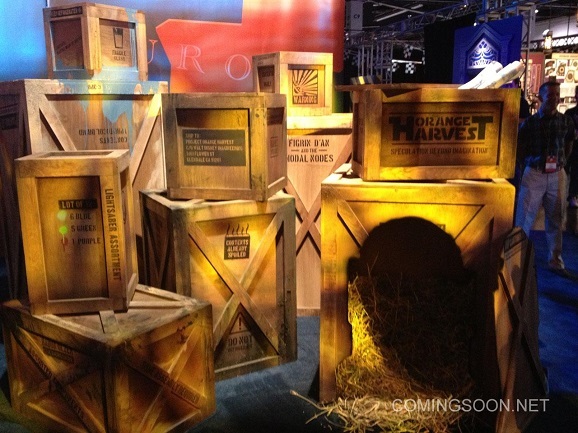 And finally, here’s a round up of all the crates gathered together, being secretive. It isn’t clear as to whether these actually contain anything that will be used in a Star Wars exhibit, or if they’re solely for pre-event purposes. Either way, they’re pretty awesome. If any of you guys are headed out to D23 this year, let us know in the comments, and may the Disneyfied Force be with you.